Kanu Equipment Takoradi celebrated their official Grand Opening on Wednesday, the 9th of November 2016. Customers were taken on a tour of the new premises where they were shown a range of equipment on display, and the new spares parts warehouse and service workshop areas. Various ‘buy, rent or rent-to-buy’ package options were explained to customers in response to their interest. 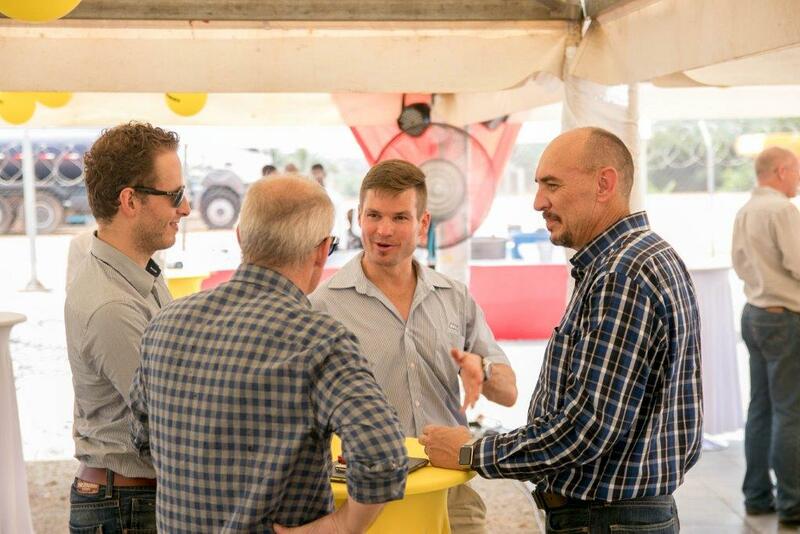 It was concluded that the event was an overall success and Directors Lara Ray Vink and Brian Shinnick agreed that they will welcome any opportunity to introduce customers to Kanu Equipment’s service, sales and support in Ghana. The following article will be published in The Daily Graphic, a local newspaper, in December. Takoradi’s mining, construction and agriculture sectors are to see improvement in sourcing tools as Kanu Equipment enters the western market with the supply of much-needed equipment, spares and maintenance. At the inauguration of its office in Takoradi, Kanu announced that not only will it make heavy equipment available but will also offer a quality maintenance team with necessary spare parts on hand to ensure quick service and continuous operation of its clients machines. In the Western Region, he said their plan was to turn the region into a central aftermarket Ground Engaging Tools (GET) , undercarriage and engine spares hub to service Accra and Dunkwa as well as the adjacent countries more efficiently. “We believe that the demand for spares in the western region and neighbouring countries are ever-increasing and to live true to our company promise of ‘Experience the Support’, we need to deliver more speedily to achieve that,” he said. The company Mr. Smithyman said was very much aware of the needs of the modern day customer who demand high value for money. With its high spare part availability, world-class maintenance team, large rental fleet, faster delivery time he believes that Kanu will serve the requirements of its clients most effectively. He said that currently, the company supplies a range of equipment and spare parts from, amongst others; Liebherr, Bell, Finlay, TigerCat and CTP for mining operations. In other areas, Mr. Smithyman said that construction, agriculture and road maintenance machines were also available and that the company was excited to represent world class brands in Ghana supplying aftermarket Caterpillar spares and ground engaging tools and undercarriage suitable for all makes of earth moving machines. Sustainability he said is one of the main focuses of every business operation and since Kanu’s business model has adopted a multi-faceted approach, not only is the focus on top of the range machine sales but also investing in the future growth of its customers by reducing their cost of doing business. At the ceremony, customers who spoke to the Daily Graphic said that some of their biggest challenges were availability of equipment and the ability of the supplier to provide support services. As indicated, there are several machines in the region that are not functional due to the unavailability of support from the suppliers who are offshore. With the emergence of Kanu Equipment’s wide range of spare parts backed by excellentservice it would go a long way to support their operations in the region and the country with offices now in Dunkwa, Accra and Takoradi.